The new year is here and we're all motivated to make 2019 better than 2018. However, the truth is, most owners never reach the level of success and Freedom they are really after. Owners can be forced to wear so many different hats that it leads them down a path of failure. They get stuck in the everyday tasks of working IN their business and don’t find the time to work ON their business. Overwhelming feelings kick in. They lose their vision. Once their vision is lost, so is their motivation. Once that goes, bring on the burnout. As you can see, this isn't a path any owner wants to go about. 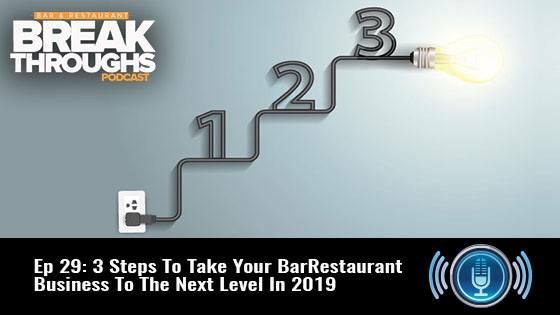 Good news is, we've got 3 simple steps for you to follow that will take your bar or restaurant business to the next level in 2019. How many hours do you want to be working? What work do you hate doing / what work do you enjoy doing? Do you want one location that can run itself while you’re on vacation for 2 weeks or do you want multiple locations that can run themselves? There will definitely be more questions you’ll want to answer for yourself but these are some starters to get your mind going. What you are really doing is defining your goals. Your business goals. Hell, even your life goals. When you’re doing this, don’t just day dream about them. Document them. Write them down. Write them down numerous times until they are seared into your brain. If you have to put them on your car dashboard, your bathroom mirror. Where you can that you'll visually see them everyday. Now that you have your big goal written down, we need to create an action plan. Ever heard the phrase, “Fail to plan then plan to fail?” Theres a ton of truth to that. The University of Scranton says that only 8% of people achieve their goals for the new year! 8%! Why so low, you ask? Well, they don't map out an action plan. An action plan is really just baby steps to achieving the big goal and sticking to it. Let me give you an example. Let’s say you want to add more revenue to your business. 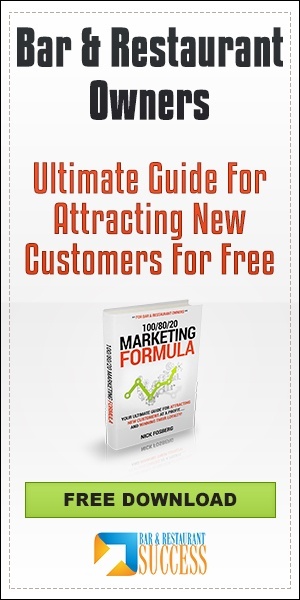 You want to add another 100k in sales to your business this year. That sounds like a huge goal. Let’s break it down because it's NOT really that hard. That's another $8k per month, or another 2k per week. That means you have to increase 4 days out of your week by $500. Over the course of a year, is it possible to increase 4 days of the week by $500 each? Absolutely! Now, can you increase 4 days / nights by $500 within a months time. It's possible by raising your prices a bit (which if you haven't in the last year or two, you're due) and what kind of aggressive marketing plan you put in place. Honestly though, for most owners this could be achieved after 4 months if each month you focused on ONE specific day and put all your marketing power and promoting power into that one day. After 30 days with an aggressive marketing plan and your employee's on board to help promote, there's no reason you shouldn't be able to increase sales by $500 in one night. Now that you have reverse engineered your goal to create an action plan, does that extra $100k a year goal sound so overwhelming? No, not at all. Increasing sales by $500 a day for a few days a week, is it? Need some help getting there? 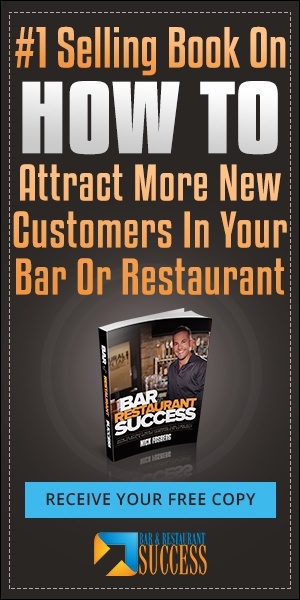 Work with me in the BARS Inner Circle and I can personally help you add more revenue and create new promotions. Click here and try it out for 30 days risk free. On a different note, what if it’s more freedom from your business that you need? Your action plan will then be training certain members of your team to take on new tasks. 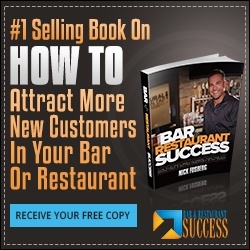 Example: Last thing owners should be doing is inventory, payroll, ordering, scheduling, cleaning, bartending, etc. Yes, maybe when you first get into the business, but eventually you'll want to only work 10-20 hours a week, which means you'll need to outsource work that you can pay someone $8-$15 an hour for. My advice to build a stronger team is having a manager meeting every week and a complete staff meeting once a month. This will help fix problem areas and create better systems to give you more freedom to work ON your business and not IN your business. You've got your vision of what you REALLY want out of life and business. You've created a plan and mini goals to make your vision a reality. Now it's time to take action. Pick 2 or more hours a week that you're going to focus working ON your business/goals. Put it in a calendar. Those two hours, say it's from ten to twelve on Mondays, that's where you're working ON your business. Not in it. DO NOT SPEND THIS TIME AT YOUR BUSINESS! Whether you go to a coffee shop or you just sit at home, don’t do it in your business. You will not get it done. Trust me on this. Don't Leave Out "Learning Time"
Part of your action plan should also have "learning time." 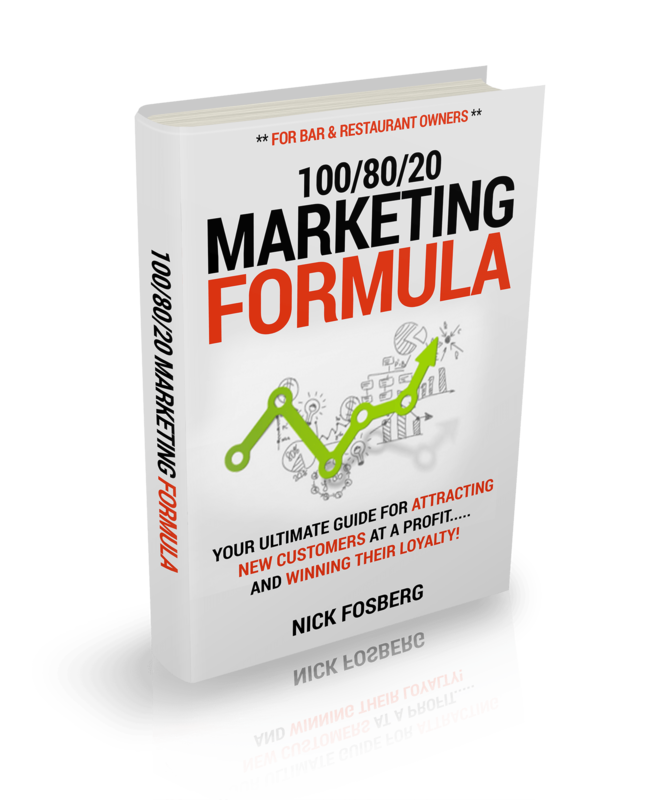 Educating yourself more on what you want most out of your business. Could be marketing, productivity, leadership, personal development, etc. How do you do this? By reading, watching videos online, hiring an expert, etc. There's a quote I read awhile back "When you stop learning, you start dying!" There's something new to learn everyday! We need to keep our mind fresh with NEW ideas. Bottom line, if you're trying to better yourself or your business, finding a mentor or business coach is one of the best investments or learning on your own through videos, books, and courses. For fastest results, finding a mentor / coach is best. If you want to take your business to the next level, you first need to really think to yourself "What does the next level really mean?" How do you want your day to day life and business life to look like? Once you do that, really think down to what steps you need to take to get there. What parts of your business needs to be fixed or improved for you to be happy? Then take MASSIVE action. So you don't get lost, keep your goals written in front of you daily. On your desk, in your car, a pop up on your computer or your phone. If you'd like some help taking your business to the next level in 2019, click here and work with me for 30 days risk free.